Robometricschool. 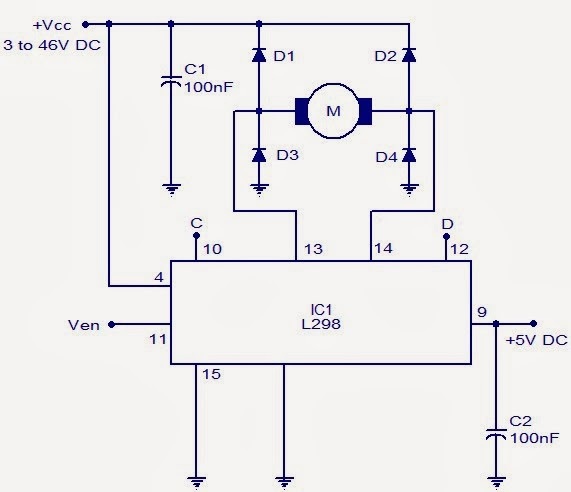 - One of the useful integrated circuit (IC) that used to drive DC motor is IC L298. Using IC L298 we can make electronic circuit schematic easily to drive our DC motor clock-wised and anti clock-wised. In this time we want to show you simple electronic circuit schematic of H Bridge Motor Controller that using IC L298. We called this is a simple electronic circuit because only need few of electronic component like capacitors and diodes, not any resistor that usually commonly used in other electronic circuit. The circuit is based on the IC L298 from ST Microelectronics. L298 is a dual full bridge driver that has a wide operating voltage range and can handle load currents up to 3A. The IC also features low saturation voltage and over temperature protection. In the circuit diode D1 to D4 are protection diodes.